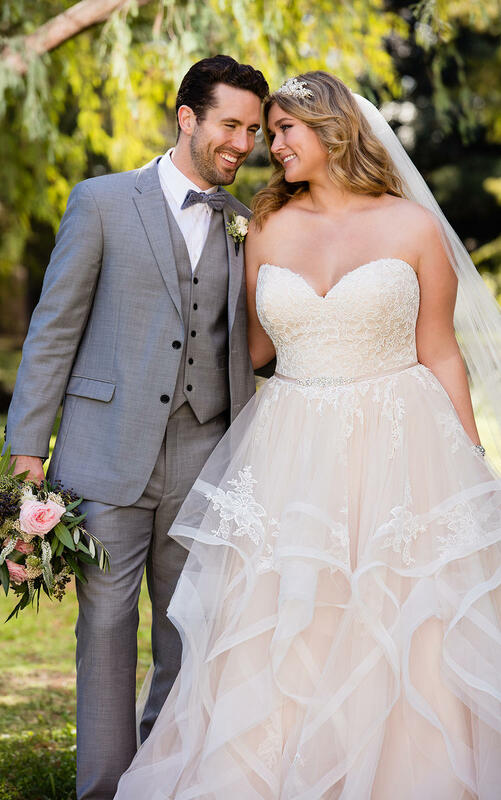 This pink floral lace plus size wedding dress with textured skirt from Stella York is a masterpiece! The fun and frothy layers of tulle create a skirt full of big, yet soft texture that is complemented by lace motifs throughout, adding volume and interest. Lace and tulle over Regency organza make this ball gown a dream dress for the bride wanting blush tones on her wedding day. Diamante beading throughout give a subtle sparkle while the double horsehair detail on the skirt is reminiscent of couture gowns.